"Gemstones of narrative. Something new, funny, astonishing." "Tales tall, tragic, and tantalizing." "Stories from all walks and talks of life. Tales of yore and ones that make you scream for more-those that will delight with insight while moving an audience from laughter to tears." 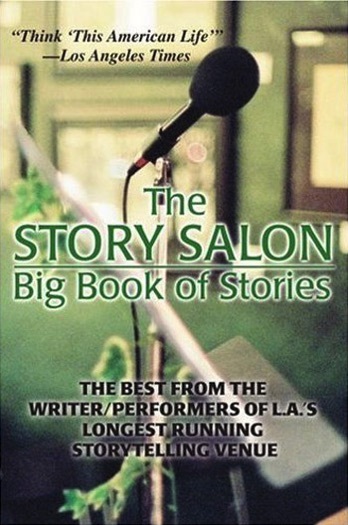 Story Salon is Los Angeles's longest running storytelling venue. What began as an alternative to stand-up clubs and self-conscious performance spaces has been challenging performers and audiences for more than a decade. Created in a North Hollywood coffee house Story Salon now reaches the globe through Podcasting, publishing, and recordings. The rules of the Story Salon haven't changed since it started: Five to seven minutes of original material performed by the author. The result is a unique blend of observation, memoir and comment that makes the Salon one of the most eclectic entertainment experiences available. More than a dozen solo theater works have been developed at Story Salon, as well as a CD of stories, and several books. "Live storytelling is a unique art form," says Story Salon founder, writer/actor/comedian Beverly Mickins. "Words spoken aloud paint pictures capable of evoking laughter and tears, the whole range of emotion. People have been telling each other stories since the first campfires, talking about the whole mix of things, important and trivial, that go into making life. Storytelling is one of the ways we figure out how to be human." Collected here for the first time in Big Book of Stories are more than forty original pieces first performed by their authors at Story Salon. It's an omnibus of memories, rants, affirmations, and shaggy-dog stories that once opened is impossible to shut. The writer/performers of Story Salon include actors, comedians, musicians, photographers, war correspondents, students, life coaches, former clowns, recovering attorneys, one admitted juggler, an international fashion model, several husbands and wives, and one mother and daughter as well as American Comedy Award-winning comedian/writer Cathy Ladman, Emmy Award winning writer Joseph Dougherty, and Story Salon?s producers: Beverly Mickins, innovative Podcaster Lance Anderson, and popular writer/comedian Dan Farren.